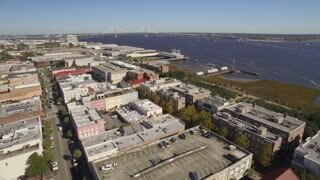 An aerial establishing shot of Charleston, South Carolina. The Arthur Ravenel Bridge is seen in the background. A high angle aerial daytime establishing shot of Topsail Island, North Carolina. A daytime reverse aerial establishing shot of the beach at Topsail Island, North Carolina. A daytime aerial establishing shot over the Topsail Island shoreline in North Carolina. 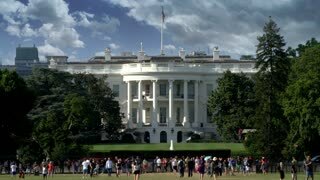 WASHINGTON, D.C. - Circa August, 2017 - A sunny daytime exterior establishing shot of The White House with tourists in the foreground near the South Lawn. Shot in 5K. A high angle daytime aerial establishing shot of the South Side Flats in Pittsburgh, PA.
A daytime establishing shot of the Santa Monica beach skyline.